Level 1. All Regions DVD. 56 minutes. 14 exercises. 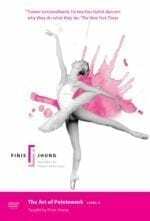 Judith Weiss, New York’s most experienced pointe-shoe fitter, tells you all about the construction of the pointe shoe and how to find the shoe for you. Fourteen year-old Ashlee Knapp shows you special foot and ankle strengthening exercises, how to correctly prepare your shoe and foot, and how to tie your ribbons. Finis and Ashlee show you how to do the soft toe work required today. You’ll learn to use your weight and energy so that you can roll up and down on pointe with delicate strength and ease, as Ashlee does. Your first steps are the most important, and this video will make sure you put your best foot forward. The CD music of Scott Killian makes this a magical experience. ALL REGIONS DVD 56 minutes. Introductory section, 14 barre exercises. Taught by Finis Jhung. Demonstrated by Aslee Knapp. Advised by Judith Weiss. Music by Scott Killian: New Ballet Music 3.